The name means ‘Moor of the Fair Nook’. The first known occupier was Jenkin Lloyd, grandson of Howel ap Jenkin Lloyd of Blaiddbwll and son of Owen Lloyd and his wife, Elen. He married Lleucu, daughter of David Gwyn Gwalter. His second wife was Margaret, daughter of Jenkin ap Owen John of Clynhenllan (who had formerly been married to Thomas Jenkin Lloyd of Clynfiew). Their son, Thomas Lloyd, inherited. His son, Jenkin Thomas Lloyd ‘…of ye Place…’, married Angharad, and had three daughters and co-heiresses. Margaret married Stephen Jones, son of John Griffiths of Clydey, and came to live here. Crusilla Lloyd married Thomas ap Gruffydd of Panterlys. On 31st March 1629 Jenkin Thomas Lloyd wrote his will, in which he referred to Margaret Jones – his eldest daughter – and her husband, Stephen Jones; his wife, Angharad Lloyd; his daughter – Cristey Jenkin – the wife of Thomas Griffiths of Llandygwydd; and his daughter Ann Verch Jenkin. On 9th November 1636, “…Tythin bach Rhos Gilwen…” was sold by Evan William of Cilgerran to Stephen Jones of the same parish. In 1641 Stephen Jones occupied Rhosygilwen. Margaret & Stephen Jones had three sons and one daughter – Anne Jones, whose pre-nuptial settlement was dated 3rd November 1654. She married David Morris Griffith ap Eynon. On 2nd January 1664 Stephen Jones wrote his will in which he referred to his son and heir, Thomas Jones; his second son, Jenkin Jones and Jenkin’s daughter, Elizabeth Jones; his daughter Anne Jones – wife of David Morris; and his second daughter – Angharad Jones. In 1670 Jenkin Jones, second son of Stephen & Margaret Jones of Rhosygilwen, was assessed at three hearths for the hearth tax. He had married Rebecca Weld of Buckinghamshire. On 20th May 1672 Jenkin Jones was referred to as a Nonconformist with a preaching license, conducting services from his own home. In 1675 James Davies, “…a moderate Presbytarian…”, was officiating at religious gatherings here at the behest of Captain Jenkin Jones. The will of Stephen Jones was proved on 18th July 1676, but was contested by Thomas Jones and his wife, Ann Jones, on 3rd October. Thomas Jones also referred to his brother, Jenkin Jones. Thomas Jones, the heir of Stephen Jones, died without issue before 1676, having been married twice. In 1681 Jenkin Jones was resident. The will of Jenkin Jones was proved on 25th June 1689 – his only son and heir was Theopilus Jones of Rhosygilwen, then a minor. He also left a wife – Rebecca Jones. In 1692 Theopilus Jones was still resident. He married twice. His first wife, Elizabeth Warren, daughter of William & Dorothy Warren of Trewern, bore him a daughter, Anne Jones, and a son of whom nothing is known. His second wife, Elizabeth Jones, the daughter of coroner Thomas Jones of Pantyderi, died on 10th June 1697 at the age of 31. She had borne Theopilus Jones a daughter, Ada Jones, who died without issue. His eldest daughter, Anne Jones, married Jonathan Colby of Bletherston, and they took up residence here. Theopilus Jones and others were summoned to a consistory court in 1701, charged with the mis-appropriation of tithes. In his will, dated 27th October 1701, Theopilus Jones names his wife, Elizabeth Jones; his son, Stephen Jones; daughter Anne Jones; his reputed daughter Dorothy, a minor; and daughter Rebecca Jones. Theopilus Jones is named on the list of those who contributed towards rebuilding Cardigan Church in 1702-03, when he gave 5s. Circa 1715 John Colby married Anne Jones of Rhosygilwen. In 1717 Thomas Colby was born here, eldest son to John Colby, who was the son of Lawrence Colby. John Colby the younger was baptised on 26th August 1718. John Colby was a warden for Cilgerran Church in 1717-18 and 1732. John Colby’s second son was Stephen Colby who occupied Ffynone. On 2nd August 1734 John Colby, gent., lived at Rhosygilwen. On 13th February 1738 Thomas Colby accused Abel Gower of Glandovan of assault. The case was rejected. On 4th March 1738 Stephen Colby and Thomas Colby, in association with others, were accused of unlawfully entering the house of David Philip in Cilgerran. The prosecution was brought by Abel Gower, but was dismissed by the court. On 21st April 1738 Anne, a servant maid to Mr. Colby, was buried at Cilgerran Church following her recent death. On 13th November 1739 John Colby, son of John Colby, was buried at Cilgerran Church following his recent death. On 29th November 1741 the funeral service was held at Cilgerran Church for Anne Colby, wife of John Colby. On 5th June 1744 John Colby leased Cilwendeg. Reference was made on August 8th 1744 to John Colby of Rhosygilwen, and his son and heir, Thomas Colby, and to the intended marriage between Thomas Colby and Esther Davies. On 15th August 1746 John Colby, the son of Thomas & Esther Colby, was baptised at Cilgerran Church. In 1747 Thomas Colby was a warden of Cilgerran Church. In 1748 Thomas Colby’s donation of £1.1s. towards rebuilding the tower of Cardigan Church, was commemorated on a plaque there. Thomas Colby was the son of John & Grace Colby of Rhosygilwen. On 19th November 1748 Thomas Colby accused four local men of riot and breaking a hedge and bank belonging to his estate. On 16th August 1749 Anne Colby, the daughter of Thomas & Esther Colby, was baptised at Cilgerran Church. On 1st May 1751 Hesther Colby, daughter of Thomas & Hesther Colby, was baptised at Cilgerran Church. On 8th January 1753 reference was made in a will to Katherine Thomas, illegitimate daughter of Thomas Colby of Rhosygilwen, and his legitimate daughters – Anne Colby (eldest daughter) and Hesther Colby. Captain Stephen Colby of the same address was also mentioned. In May 1755 Stephen Colby lived here, and married Jane Davids of Haverfordwest that month. On 21st October 1755 Thomas Colby, son of Thomas & Esther Colby, was baptised at Cilgerran Church. In 1756 reference was made to “…Rhoseygilwen Mill…” On 22nd July 1756 Thomas Colby was still married to Esther Colby. The property was leased for a year from that date by Thomas Colby to another Thomas Colby of Rhosygilwen, Hugh Owen of Landshipping and George Bowen of Llwyngwair. Thomas Colby’s father, John Colby, died in 1759 and was buried at Cilgerran Church on 16th August 1759. Thomas Colby was mentioned again on 31st October 1759. In 1759 John Colby owned the estate. Thomas Colby had four sons by his wife, Esther Colby – John Colby of Ffynnone [married a daughter of James Higgon of Scolton]; Robert Colby of Somerset [took Holy Orders and married Miss Vaughan of Brynog, Cardiganshire]; Charles Colby, Captain of the 98th Regiment, served in the Chinese War in 1848 – was killed by a tiger in Rawul Pindee, India; and Edward Colby of Rhosygilwen. Edward Colby also served in China in 1848, but soon afterwards left the army and returned to Rhosygilwen. Of the four daughters of Thomas and Esther Colby, one married Major William Henry Lewis of Clynfiew; another married Edward Bearcroft of Worcestershire and died young, having given birth to one son; the third married naval officer Captain Boyd who later died in Dublin attempting to save a drowning man; and the fourth died unmarried. In 1770 Thomas Colby of Rhosygilwen was the Sheriff of Pembrokeshire. In October 1774 Thomas Colby became the Mayor of Cardigan. On the last day of that month he presided over voting at the Cardigan Boroughs election. He declared Sir Robert Smyth elected. On 28th November 1775 a petition against the result was raised in Parliament. Thomas Colby was accused of “rigging” the vote, and on 17th December 1775, Thomas Johnes was elected. Thomas Colby was still resident in 1779. In 1779 John Davies was a servant here. In August 1779 Mrs. Esther Colby died, leaving children named John Colby; Thomas Colby; Anne Colby; Esther Colby and James Colby. She was buried at Cilgerran Church on 16th August 1779. In December 1780 John Colby died intestate, his estates passing to his only surviving brother and heir – Thomas Colby. Reference was made in 1781 to Thomas Colby of Rhosygilwen and his son, Thomas Colby, by his late wife, Esther Colby. In 1784-94 the Colby daughters were educated in London. On 12th November 1789 Thomas Colby wrote his will, referring to his eldest daughter Ann Colby; daughter Hester Colby; youngest daughter Jane Colby; and son Thomas Colby – 1st Lieutenant and mariner. Thomas Colby’s will was proved on 3rd November 1790. In 1793-1803 Miss Colby was the occupier. On 17th November 1801 Thomas Colby released to John Bowen of the Priory, Cardigan, a parcel of ground called Castle Green and a tenement on High Street called Ty Brith in Cardigan. On 19th November 1811 Probate of the will of Thomas Colby was made. On 27th February 1837 John Humphreys of Rhosygilwen intended releasing the property to John Colby. In 1838 the house was owned by John Colby and occupied by Mary Colby and reverted to them following Humphreys’ death. On 3rd April 1839 John Colby of Ffynnone leased the property to his mother, Cordelia Maria Colby. On 3rd September 1840 John Bryde (?) of Londonderry married Cordelia Colby of Rhosygilwen. In 1841 the following persons lived here: Catherine Maria Colby, 50; Mary Colby, 20; Elizabeth Colby, 15: and 8 servants. On 30th June 1842 Eliza Colby lived here. In 1843 the Colby family gave money towards a new Rectory for Cilgerran. On 4th October 1843 Robert Colby lived here with his mother, Cordelia Maria Colby. On 24th December 1869 Cordelia Mary Colby of Rhosygilwen died. On 23rd February 1870 there was a sale of stock and crops here. Circa 1870 James Stewart, nephew of Elizabeth Gower of Castle Malgwyn Mansion – her sister’s son, moved here with his wife and children. Captain James Stewart lived here in 1871-77. In 1871 the property was occupied by the following persons: James Stewart, 40, late Captain in the military; Louisa Charlotte Stewart, 33, his wife; James Logan Stewart, 5, their son; Louisa Evelyn Stewart, 3, daughter; Margaret Stewart, 1, daughter; plus servants – James Morris, 26, coachman; Sarah Mallory, 35, head nurse; Mary Dew, 17, under nurse; Anne Davies, 24, parlour maid; Elizabeth Nicholas, 45, cook; Elizabeth Thomas, 35, house maid; Elizabeth Nicholas, 27, dairy maid and, at the Lodge, Mary Thomas, 64, widow, labourer. On 11th November 1873 William Edmond Logan Stewart was baptised at Cilgerran Church – the son of James & Louisa Charlotte Stewart. Captain James Stewart’s wife, Louisa Charlotte Stewart, died here on 24th January 1877 aged 38. The funeral procession a few days later comprised 3 family and 30 gentry carriages. On 10th March 1882 the property was advertised to let. On 3rd July 1885 builders were being sought to conduct alterations to the house. This was, in fact, a complete rebuild to designs by George Morgan of Carmarthen. Work was under way in 1887, including a new coach-house and stables, all for Rev. Robert Colby. An Adam-style drawing room in the house was, perhaps, by C. Young of Pembroke. The new house retained elements of the older building in the SW service wing. In 1890-1902 John Vaughan Colby occupied the property. In 1891 the following persons lived here: Mansion: Caroline Rowland, 42, cook; Margaret Lewis, 25, housemaid; and William Venables, 22, footman; Gardener’s House: George Forrest, 29, gardener; Jane Forrest, 26, his wife; and Joseph W. Forrest, 1, their son; Lodge: Ann Jones, 73, widow, lodge keeper; Rachel Davies, 40, her daughter, dairymaid; Elizabeth Davies, 22, grand-daughter, housemaid; and Rosinna Davies, 7, grand-daughter. In 1899 Laurence Colby, son of John Vaughan Colby of Rhosygilwen, volunteered for service in the South Africa War. In 1900 John Vaughan Colby of Rhosygilwen was the President of the Cardigan Agricultural Show. In 1901 the following persons lived here: Mansion: John Vaughan Colby, 45 (b. Devon); Annie Colby, 40, his wife (b. Gloucestershire); William Tuffman, 38, butler (b. Wiltshire); William Ondin, 23, footman (b. Stafford); Thomas Thomas, 19, footman (b. Manordeify, bilingual); Agnes Corman, 26, cook (b. Ireland); Elizabeth Lewis, 26, housemaid (b. Haroldston); Maria Reynolds, 19, kitchen maid (b. Llandygwydd, bilingual); Mary Howells, 19, scullery maid (b. Cardiganshire, bilingual); Ann Davies, 36, housemaid (b. Cilgerran, bilingual); and Elizabeth Osgood, 39, maid (b. Somerset). The Gardener’s Cottage was occupied by the following persons: James Grimes, 34, gardener (b. Lancashire); Ada Grimes, 36, his wife (b. Hereford); Ada E. Grimes, 11, their daughter (b. London, bilingual); Alice Grimes, 10, daughter (b. Croydon, bilingual); and Robert R. Grimes, 11 months, son (b. Cilgerran). In the stable yard lived the following persons: John Evans, 26, groom (b. Slebech); and in a separate unit: David Williams, 19 (b. Lancashire). All were English-speaking except where indicated. In 1902 John Vaughan Colby was a special juror. In August 1903 Lieutenant Laurence Colby, son of John Vaughan Colby of Rhosygilwen, came of age. 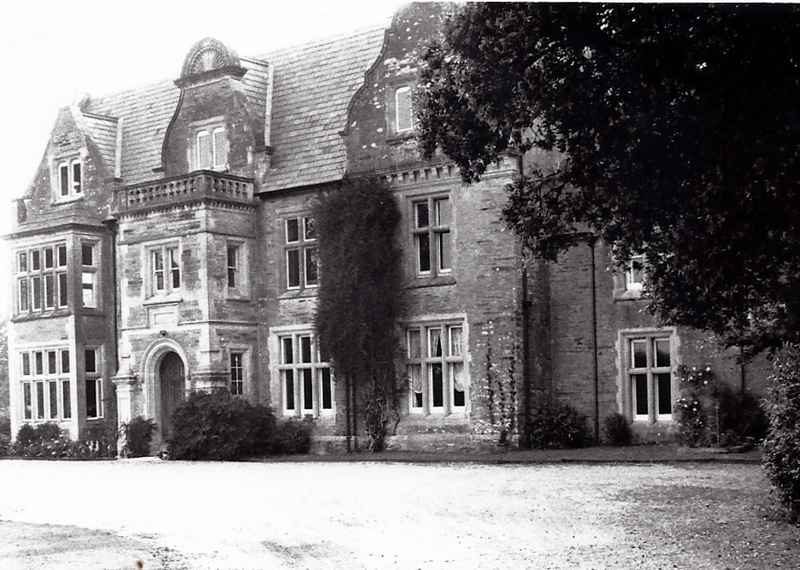 In December 1903 Rhosygilwen was sold to Mr. Charles Evan Davis Morgan-Richardson of Noyaddwilym, Llangoedmor. He paid £8000 to purchase it from John Colby of Ffynnone, including 200 acres of land called Ciliast Fields, Penalltfedw and Cnwcgyrn. He re-named the property “Morgenau’. In 1903-13 C. E. D. Morgan-Richardson lived here. C. E. D. Morgan-Richardson wrote the novel ‘Henry Vaughan, a Story of Pembrokeshire’. In 1906 C. E. D. Morgan-Richardson’s son – Charles Lethbridge Ernest Morgan-Richardson, was being educated in France. In 1908 C. E. D. Morgan-Richardson was the President of Cardigan Agricultural Show. In 1911 C. L. E. Morgan-Richardson qualified as a solicitor and was admitted as a partner in his father’s firm in 1912. On 29th September 1913 Mr. Charles E. D. Morgan-Richardson died aged 56. On 1st April 1914 the Morgenau Herd was sold. On 4th July 1914 Evelyn Beatrice Morgan-Richardson, widow, lived here. 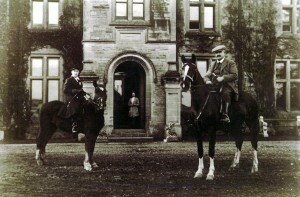 In 1914 the property was leased out for the duration of the war, the Morgan-Richardsons having moved to Treforgan, Llangoedmor. On 18th September 1917 Miss Evelyn Morgan-Richardson married Rev. John Jones, Vicar of Mwnt and Ferwig. On 2nd October 1919 a clear-out sale was held here for Mrs. Pugh. In 1919 T. J. Davies of Morriston leased Morgenau from the Morgan-Richardson family, with a view to buying it. In 1920-21 Mr. & Mrs. T. J. Davies lived here. In January 1923 T. J. Davies, J. P., of Morriston and Rhosygilwen, died aged 51. In July 1923 the property, ‘Morgenau’ was advertised for sale with 13 bedrooms and 170 acres. On 27th and 28th September 1923 there was a clear-out sale of stock, crops and implements held here for Mrs. T. J. Davies. In 1923-61 Charles Lethbridge Ernest Morgan-Richardson lived here. In October 1923 Mrs. Morgan-Richardson and her son, C. L. E. Morgan-Richardson, moved back to the property from Treforgan, and re-named it ‘Rhosygilwen’. In 1924 C. L. E. Morgan-Richardson of Rhosygilwen was President of Cardigan Agricultural Show. The head gardener here was William Crump. On 15th May 1927 Mrs. Evelyn Morgan-Richardson, formerly of this address, died in Bournemouth at the age of 63. In 1934 Charles Lethbridge Ernest Morgan-Richardson was President of Cardigan Agricultural Show. On 12th February 1935 there was a sale of building materials here following the demolition of a conservatory. A piano was also offered for sale. On 4th October 1935 there was a sale held here of stone copings and other building materials. On 26th August 1936 a fete was held here to raise funds for Cilgerran Castle. In 1943-57 W. Andrews was operating as a florist here. In 1956 C. L. E. Morgan-Richardson was chairman of the Cilgerran Parish Council. C. L. E. Morgan-Richardson died on 29th December 1961, aged 73. On 5th-6th September 1962 there was a sale of contents held here. The house and estate were then sold. In 1964 Mr. & Mrs. J. Cresswell-Evans moved here. On 28th June 1968 Miss Sarah Yolande Jane Cresswell-Evans of Rhosygilwen, married Derek Roberts Parkinson of Roehampton, at Cilgerran Church. In March 1976 John Cresswell-Evans of Rhosygilwen died aged 75. In 1984 the property was offered for sale. On 22nd May 1985 the house was gutted by fire. The house became a listed building in 1994. Restoration began that year. By 28th December 1995 the property had been almost fully restored and was being run as ‘The Pembrokeshire Retreat’ retreat by March 1998. In 2003-04 a large hot-house was restored here. On 29th July 2006 the new ‘Neuadd y Dderwen’ concert and arts venue was officially opened. “…EXTERIOR – Country house designed by George Morgan of Carmarthen for the Rev. Robert Colby. Fire damaged in 1985 and re-roofed since. Grey Cilgerran cut stone with Bath stone dressings, slate roof, coped gables and rebuilt brick stacks. Jacobean style near-symmetrical five-window, two-and-a-half storey front with one rebuilt ridge stack. Ashlar mullion and transom windows to main floors, mullion windows with curved heads to attic. E front has varied gables, left straight-sided with 2-light window, centre steep curved sides and semi-circular shell pediment and 2-light, and right is shaped curved with 3-light and finial. Projecting 2-storey bay to left with 5-light windows and stone hipped roof, then 2-light window each floor, centre projecting porch bay with strapwork parapet, first floor 2-light mullion window, plaque beneath under stepped hood and arched doorway with hood. Ledged doors. Ashlar panelled piers clasping outer angles. Fourth bay has 3-light to ground floor and 2-light above, as does fifth bay, but this has an ashlar modillion cornice under gable. Rendered S end, the gable with kneelers, 3-light attic window and 2-light first floor window. N end has low one-and-a-half storey service wing with rebuilt tall brick ridge stack, hipped end roof and 2-window range of 2-light windows, those above breaking eaves under stone shaped curved gables. GARDEN FRONT – Parallel roof to rubble stone garden front with two rebuilt ridge stacks, and shouldered gable each end. Left gable has kneelers and finial, 3-light attic window, 3-light windows to main floors. To right, 2-light each floor, then central shaped curved dormer gable with 2-light, then big 3-light leaded stair window with two transoms over projecting single-storey range with strapwork parapet and door between two windows. Right end bay is gutted (1993) but has first floor 3-light window and part-collapsed gable with sill of 4-light window. S return, continuous with S end of main front, has shaped curved dormer gable with 2-light window, first floor 3-light and 2-light windows and ground floor large square bay window with strapwork parapet. N end has service range with two straight gables over eaves-breaking 2-light windows and hipped N end roof. Between the two N service ranges is narrow court with access to house service door. INTERIOR – Upper floors burnt in 1985 but large oak staircase survives with ornate rail. Stained glass stair-light. Ground floor two main rooms and entrance hall joined into one. Included as the best example of a small country house in elaborate period style by George Morgan. THE COACH-HOUSE, RHOSYGILWEN – 1887-8 coach-house and stables to Rhosygilwen, designed by George Morgan. Rubble stone with ashlar dressings and slate roofs. Single-storey U-plan courtyard part-converted to house. W range has two brick ridge stacks and three sets of stable entries each with two windows flanking door with cambered brick head. Windows have ashlar chamfered surrounds and iron small-paned windows. Right set has C20 casements and 12-pane sash inserted in door. To right, in angle to centre range, joined window and door, entry to C20 house. C20 rear additions for house. S facing centre range is taller with one ridge stack to left and deep bracing struts from posts and from corbels in walls each end. Three double ledged doors to carriage entries within. Outside steps to loft door on W end. E side has draft-horse stable entries alternating three doors and three windows similar to those opposite. Built for Rev. Robert Colby shortly after the mansion. I was very pleased to find the information you have on line about Rhosygilwen. I believe I am a descendant of Ann ferch Jenkin, one of the three daughters of Jenkin Thomas Lloyd of Cilgerran parish whose will is dated 1629. I am trying to firm up my belief with whatever documentary evidence I can find. As far as I can see – and I am not very good at reading these old wills – his doesn’t seem to state his residence, which I presume was Rhosygilwen. It seems too that Ann was not yet married. My quest began 30 years ago and I had almost given up when I wrote an article in the April edition of the Dyfed Family History Society’s journal about The Hassalls of Cilrhue and Eastwood. It centred on Mary Griffiths nee Harries who married my 3X Gt Grandfather Thomas Hassall of Cilrhue. As a result a certain Rhodri Dafis of the Society pointed me in a direction which lead to Leoline [Llewelyn] Davies of Clynfyw Manordivy who had married an Ann Hughes who I believe was of Llangoedmor. Apparently his father David Llewelyn of Penalltcych had purchased Clynfyw in 1684. Rhodri has a document called ‘A descent from Gwynfardd Dyfed’. The relevant section of it has Ann ferch Jenkin [alias Anne Lloyd] marrying an Alban Hughes of Llangoedmor. They had a son Jenkin Hugh who married a Mary and they in turn had a son Owen Hugh who married an Eleanor. It was they who were the parents of Ann Hughes above. All of these apparently lived in Llangoedmor parish perhaps at the Plas itself. It would be nice to think that Clynfyw somehow represents a family link. Unfortunately Rhodri does not have other documentary evidence that covers the period between Ann ferch Jenkin and Ann Hughes who married Llewelyn Davies. With all your knowledge on this area I was wondering of you might be able to help at all. By the way I have copies of private letters written between 1808 and the 1820s from Cilrhue which contain some gossip and references to others at the time. It seems the girls went to take tea at Rhosygilwen, an occasion which I imagine would have been a little more formal than it is now! I would be happy to share copies of some if you are interested. Many thanks for your quick reply. In my excitement at finding your site I forgot to mention that Anne ferch Jenkin is in fact known to have married Alban Hughes and that they a son Jenkin Hugh. It is mentioned in the document BRONWYDD 2 (B) Part 2 of Schedule par. 2026. I think it is at NLW. I was also encouraged by your confidence in Rhodri’s work and again I am most grateful.